Have you ever had a friendship where no matter what you do, it’s always wrong? 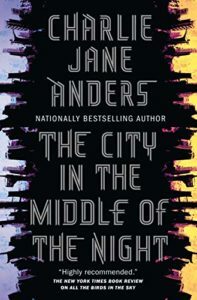 Charlie Jane Anders explores this in her second novel, The City in the Middle of the Night. It’s set upon a planet called January, a world that has a single habitable narrow zone stuck between boiling daytime and frigid night. And ohhhhh . . . this book . . . SO MUCH FEELS. In the city of Xiophant, Sophie is a working class, socially anxious girl who is roommates with Bianca, a privileged girl with rebellious tendencies. When Sophie willingly takes the fall for a petty crime Bianca commits, Sophie is banished outside the city limits, where she is not expected to survive. However, she is saved by a tentacled creature called a “crocodile,” one of the planet’s native inhabitants who communicate via telepathy and have their own complex society. As Sophie spends her new life hiding, a grief-stricken Bianca begins to rebel against the city in earnest. The story also revolves around Mouth, a smuggler who has lost her entire tribe. She travels between Xiophant and Argelo, the only other human city on the planet of January. The two cities are opposites. Xiophant has adapted to its never-ending sunlight by heavily regulating everything: when people work, when they eat, even when they sleep. A salon, for instance, geared to make people forget about schedules and time, is considered too dangerous to exist out in the open. On the other hand, Argelo is stuck in perpetual dusk, has no rules, no schedules, no existing governing body. It is a wild, decadent place that is full of rampant crime and poverty. The distance between the two cities is filled with treacherous horrors: murderous seas, monsters that can slice you up, and the crocodiles, which Sophie later give the name Gelet, who are intelligent and patient, but also terrifying in their own way. While the worldbuilding is amazing, this book is more about the relationships, which feel just as precarious as the planet itself. It is hard to say if these people are friends. Mouth’s relationship to Sophie is described as “a jinx,” as bad things happen to Sophie whenever Mouth is around. I would also say that Sophie and Bianca’s relationship is very toxic, but Anders doesn’t make it so easily defined. The relationship is fraught with miscommunication, overestimation, idealization (or idolization? ), manipulation and flat-out jealousy, but there is also a strong connection between the two that isn’t easily broken. There is a beautiful, heartbreaking scene where Sophie and Bianca are trapped in a restaurant. Sophie just wants their friendship to go back to the way it was before she was exiled, but Bianca cannot reconcile the past. It’s painful to watch them struggle through the conversation. It’s even more painful when Bianca continues with her plans to liberate Xiophant, which ultimately means manipulating Sophie into helping her. The City in the Middle of the Night left me devastated, and yet it also left me surprisingly hopeful. It had me examining my own relationships, and realizing that I should not take my friendships for granted. After writing her successful Ancillary series, Ann Leckie is now turning her sights to fantasy. Instead of writing about large sentient spaceships, she has now written a story about large (and small) sentient gods. 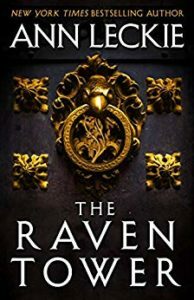 The Raven Tower may feel like a slim book, but there is so much packed in this standalone novel that I felt like I was reading a doorstopper. The kingdom of Iraden is ruled by the Lease, a ruler chosen by the Raven god, who must sacrifice himself when the god’s chosen Instrument—a raven, of course—dies. When the Lease’s heir, Mawat, arrives to claim his birthright, instead of finding his father, the current Lease, he instead finds his uncle ruling in his stead, and his own father missing and presumed by everyone to have run off to save his own life. The story is told from a god’s perspective as it observes a young man named Eolo, Mawat’s aide. In a way, the novel is a murder mystery as we follow Eolo attempting to find out the fate of Mawat’s father. As Eolo searches deeper for the truth, we learn the reason why people seem to side more with the uncle than with Mawat’s father. There is also much political intrigue and maneuvering, a theme that is echoed in the god world. All is not what it appears, and this includes Eolo, who has his own mysteries and secrets. What pulled me into the novel, however, were the stories about the gods themselves. The narrator is not the Raven god, but a god called The Strength and Patience of the Hill. It exists on a level far above humans, having seen the creation of the world, but at the same time, it is not considered omnipresent, grows slowly into its godhood, and doesn’t really care too much about humans until a tragedy happens, literally, at its feet. We see a supplicant’s worship and prayer from the god’s point of view. It has a friend—another god called the Myriad whose corporeal form is in a thick cloud of mosquitos. And as I mentioned above, it must deal with political maneuverings from other gods, which can bring about death. There is a sense of deep mythology framed in a fairy tale language that made me think of Neil Gaiman’s American Gods. Also, the god’s use of second-person POV in telling Eolo’s story is reminiscent of N.K. 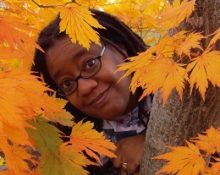 Jemisin’s Broken Earth Trilogy. I finished this book in about an afternoon, but I plan to read it again more slowly. While it’s a straightforward fantasy tale, I deeply appreciated the way it’s told. It’s a book that’s sure to stimulate the imagination of minds of a theological bent. Before I begin this review, please take a moment to admire the cover for this book. The embroidered rabbits. The gorgeous stitching. Very charming. Very quaint. The book itself is not like that. As with most time-travel stories, this book will have your mind chewing on possibilities and probabilities. 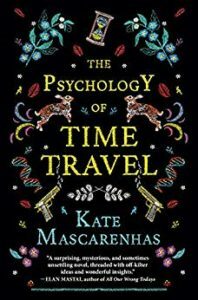 In the spirit of Hidden Figures comes Kate Mascarenhas’ debut novel, The Psychology of Time Travel. In 1967, four scientists set out to create time travel. Naming themselves “the Pioneers,” these women—Margaret, Grace, Lucille, and Barbara—invent a box that one can walk into and thus go anywhere in time. It’s revolutionary, set to change the world. But on the day they announce their discovery to the world, Barbara, the youngest scientist, suffers a mental breakdown on live television. Fearing that their credibility is at stake, the other women remove Barbara from her position, proceeding to shun her and completely erase her contributions to the project. Fifty years later, the remaining Pioneers run an organization called the Conclave, which has its own government, resources, and money centered around time travel. Barbara, now an old woman, keeps trying to find ways to restore her access to the Pioneers, and to the women she still considers her friends. Her granddaughter, Ruby, tries to dissuade Barbara from even talking about it—until a mysterious letter arrives containing the death certificate of an unnamed woman in January 2018. Wondering if this is a warning meant for her grandmother, Ruby begins to investigate the Conclave. Like Ann Leckie’s The Raven Tower, this novel also sets itself up as a murder mystery, but I was more fascinated by the intricacies of the Conclave and the different coping mechanisms its inhabitants used to deal with the effects of time travel. Throughout the book, those who time travel start to feel a certain timelessness, as if they are ghosts merely wandering through space. The lack of being rooted in time brings in a host of issues and strange quirks. When time travelers marry, they get rings engraved with their birth and death dates. They refer to their younger selves as “greens” and their older selves as “silvers.” A gorgeous scene is watching a painting being created in reverse order. The Conclave has its darker side as well. Margaret, now older, has grown paranoid over her own leadership. She becomes obsessed with mind games and institutes a hazing ritual to weed out those who won’t fit into the culture of the Conclave. Others also struggle with mental and narcissistic issues. For instance, one time traveler finds she cannot eat unless she goes to a certain park on the day of her birth to be with other versions of herself. The Conclave is deteriorating, and I wish Mascaren spent more time on that than on the murder mystery. I also wish she spent more time on Lucille, the black female scientist; the book instead focuses on another black character, Odette, as she investigates the murder. I liked her, but with so many other characters in the book, she came across a little flat. But hey, this book has women scientists. It has women of color. It has queer romance. Plus, it has dioramas depicting different scenes from the book (bit.ly/2B6XxMO) on the author’s website. You can never go wrong with that.